• Virtually indestructible and resistant to corrosive environments. through the pump with no reduction of vacuum flow. 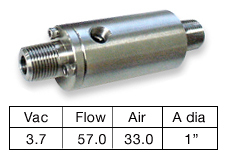 • "A" Diameter indicates the size of the straight-through vacuum passage.